Our new web site is online and this blog has moved. We will no longer be updating this blog. Have a look at our new site: SE22 Piano School. Click to visit our new web site! 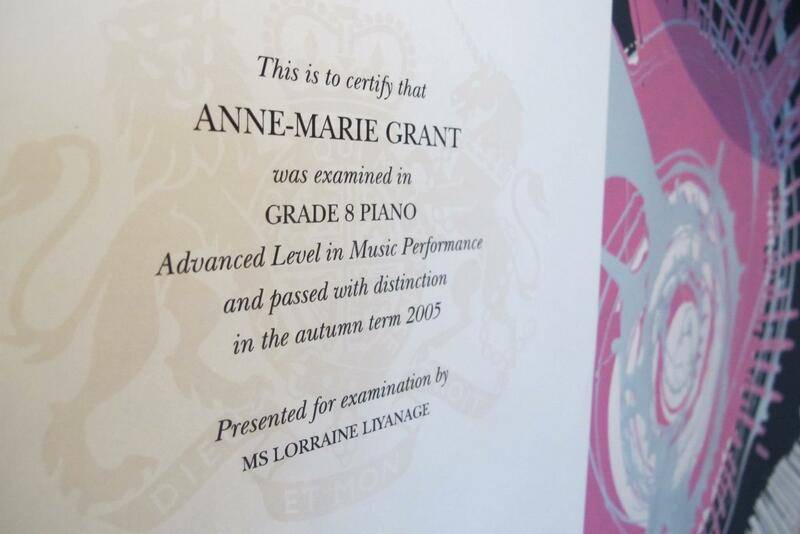 New Students: For lesson enquiries, please email lorraine@se22piano.co.uk for an application pack. Lessons are £25 for 30 minutes or £50 for an hour. We are meeting prospective students in the February half-term for a consultation lesson to determine readiness to start the piano. We have vacancies on Monday and Saturday afternoons. If you would like to socialise with fellow pianists and musicians, then have a look at our regular events in Central and South London. Observers and performers most welcome. Beginners are encouraged to come and share your repertoire. Many visitors to our site are looking for advice on buying a digital piano. We recommend the Roland SuperNATURAL digital piano. Simon Pollard from Two Circles Music can also advise on acoustic piano purchases if you are based in the UK so do get in touch with him: simon@twocirclesmusic.com. Two Circles Music also offer a great discount to our students and web site visitors, use the promotional code DULWICH13 at the checkout for a 5% discount and free next day P&P on all sheet music purchased online. Now that the Easter break is over, many of my students at the SE22 Piano School in London will start preparing for the Music Aptitude Tests that take place this Autumn for 2019 state school entry. The tests vary from school to school, but the basic sections that are included in all tests are covered in our training tests that can be purchased online. The Dulwich Music Festival adjudicators and SE22 Piano School team will be performing various recitals this year. Do come along! French Harpsichord Music as part of ‘Museums at Night’. The 4 sample tests contain 60 questions in each test (total 240 questions). If you are experiencing any issues with our online payment system, please email londonpianoevents@gmail.com and we will be able to assist you. The files are Mac or PC compatible. Use your computer or laptop to download and unzip the files. You can then transfer these to an iPad or iPhone using iTunes. Do not use Outlook to download the link, please use a browser such as Chrome, Firefox or Safari. 2017 Secondary School Entry: The timetable is available for the SW Herts Consortium Music Aptitude Tests. You can download and practice the specimen Aural Tests online so that you know what kind of tests to expect. The written test consists of questions involving three areas of music, namely PITCH, MELODY, and TEXTURE. Pitch: For example candidates listen to two sounds and have to indicate whether the second sound is the same as the first, or whether it is higher or lower. Melody: For example candidates listen to two tunes consisting of five notes. Candidates have to decide whether the second tune is the same as the first or if one of the notes has been altered. If there is a change, candidates will be expected to identify which note has been altered by giving the note number. Texture: For these questions candidates listen to a number of extracts containing multiple instruments or sounds. Candidates need to comment on the amount of instruments and compare any differences between examples. In addition to the written aptitude test, Candidates will be required to complete a musical performance aptitude test. Each child will be allocated a 5 minute slot to perform their chosen piece of vocal or instrumental music. Their aptitude for music will be further assessed from this performance and, as there is a free choice of piece, this will allow candidates of all cultures an equal chance to succeed. An accompanist will be provided. Students can bring their own CD backing track. Year 7: To use a single music aptitude test, rather than the current arrangements which employ two tests. Parents of children currently in Year 5, who might apply for a place in Year 7 for Secondary Transfer in September 2017 under Academic or Music, must register with the South West Herts Consortium. 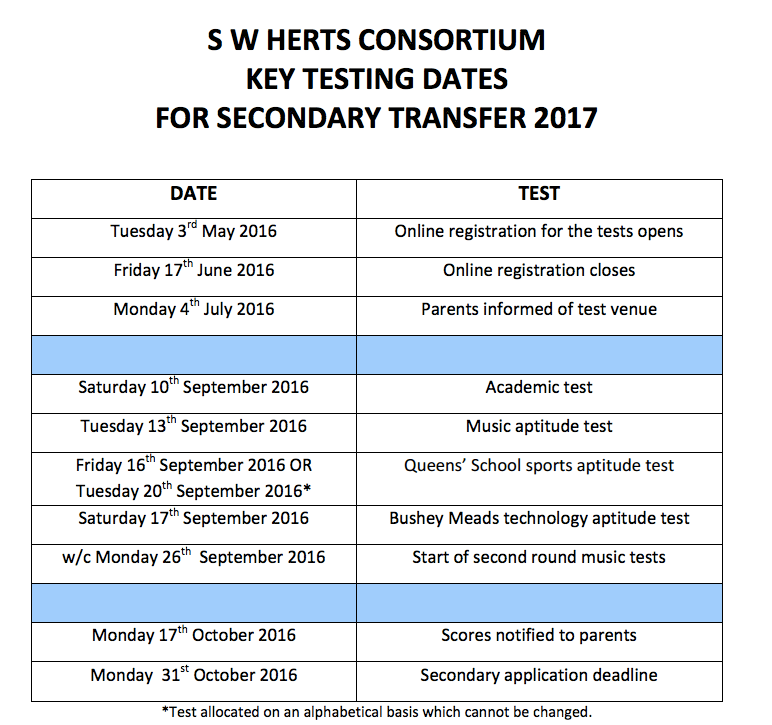 Registration for the tests will open in May 2016 and will be available via the SW Herts Consortium website: www.swhertsschools.org.uk. The entrance tests are normally held in September but the dates are not yet available.